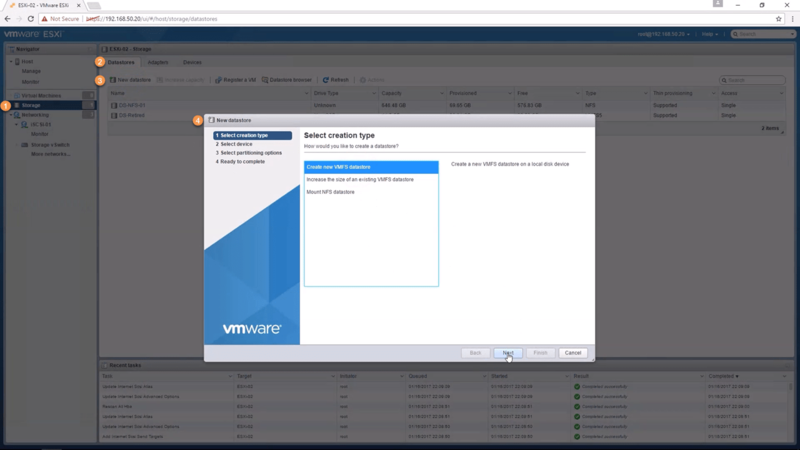 In part 1 of Configure a vSphere 6.5 Host, we configured NTP Server, SSH Service, created a vSwitch, mounted a NFS share, and redirected the scratch and syslog files. 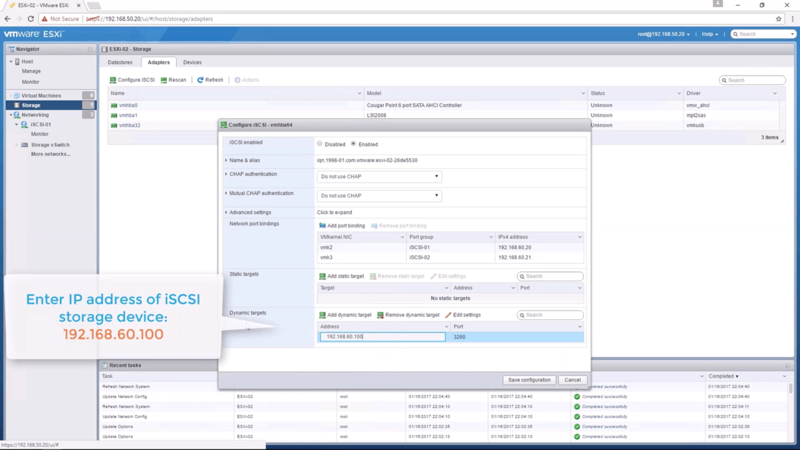 In part 2 we’re going to configure iSCSI software adapter with port binding and create a VMFS6 datastore. The demo section provides video demonstration of everything discussed in this post. 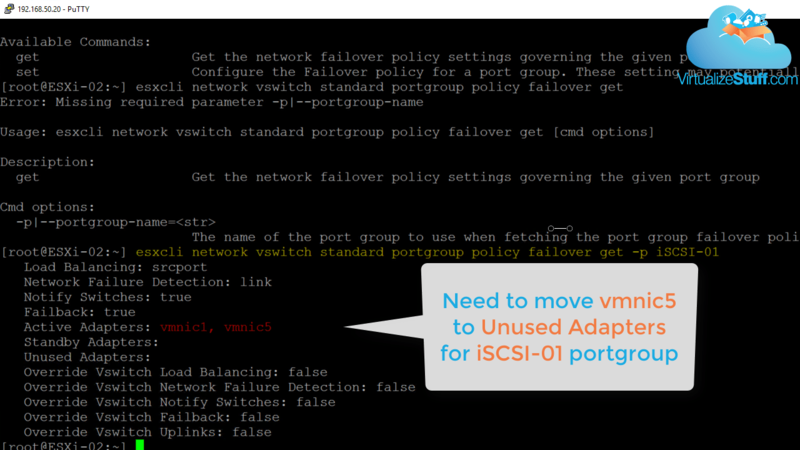 Simply repeat the above steps for iSCSI-02 portgroup ensuring vmnic5 is the active adapter. 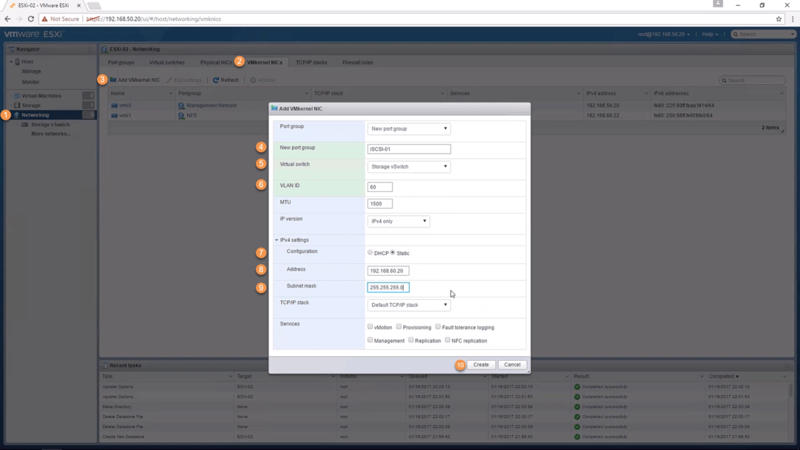 Next is to enable an iSCSI Software adapters and configure iSCSI binding. 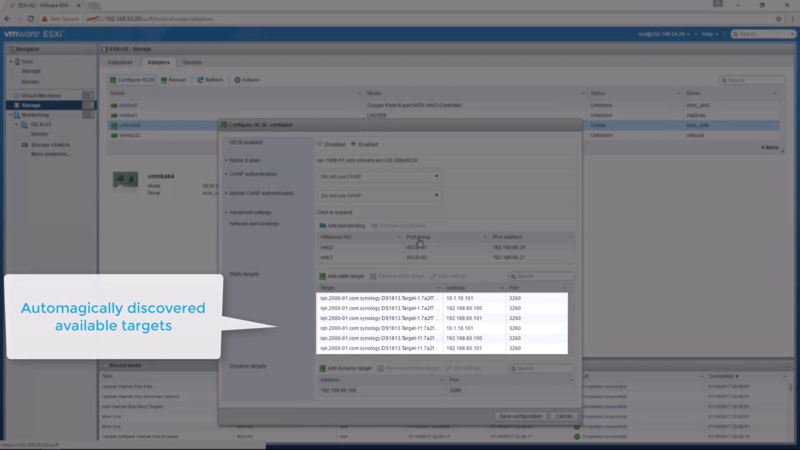 This allows our ESXi host(s) to have multiple paths back to the storage array. Both port groups now have a single active adapter, let’s add both VMkernels to the Network port bindings section of the iSCSI Software adapter and add a dynamic target using IP address 192.168.60.100, as shown in Figure-5. This allows the host to dynamically discover iSCSI targets from storage array, as shown in Figure-6. Completing the previous step allows the LUNs from the storage array to be seen by the ESXi host. Now its time to create a VMFS6 datastore which is a simple process of following the wizard. 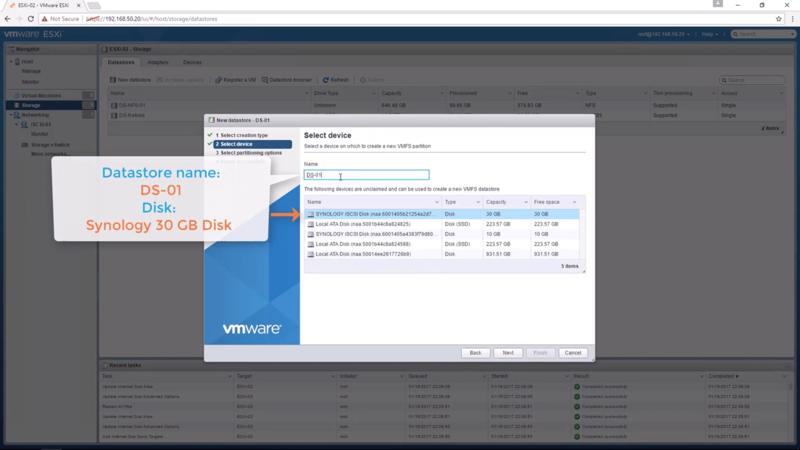 In this example we’ll use the Synology 30 GB disk, utilizing the full partition, and selecting VMFS version 6. Figure-7 provides the steps needed to launch the wizard while Figure-8 shows the disk used. The video below provides all the steps. Hi Dave, Thanks for the useful information. I noticed that you have a VLAN for Management (VLAN 50) and a VLAN for iSCSI (VLAN 60)? What if I only have a single subnet on my home network? How would the process you’ve defined here differ? Thanks. 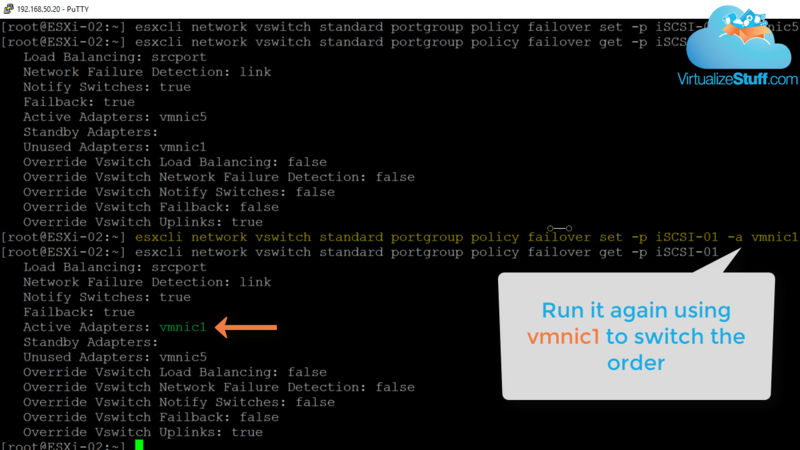 Since you only have a single subnet you can create a VMkernel network adapter for your storage interface on the existing vSwitch / vDS. I’ve set everything up the way you’ve described. The only difference is that I have Management traffic, VM traffic, and iSCSI traffic all on same VLAN. I can’t seem to get the ESXi host to utilize the multiple VMKernels. When I do a test by transferring data between the local datastore and iSCSI datastore, I only see utilization on one of the two physical NICs. Is there anything else I need to do to force the iSCSI Multipathing? Welcome to VirtualizeStuff a place where I discuss technical challenges I encounter at work or in the home lab with regards to virtualization and provide some hopefully helpful tips & tricks to ease administration. Oh! and occasionally nerding out on tech gear! The NSX-T 2.3 Bridge Firewall bug that drove me crazy!